I’ve been making scrambled eggs for years, but it’s only been a short while that I’ve learned how to make them properly. You see, I would cook the eggs like an omlette and when it was done, I’d break it up into pieces – in my mind, effectively scrambling the eggs. It was only after reading Julia Child’s My Life in France, in which she describes how she learns to scramble eggs at the Cordon Bleu that I started to wonder. I tried it, stirring the beaten eggs in the pan as they cooked, so that the cooked egg would mix with the uncooked egg until they were creamy, fluffy, scrambled eggs. I’ve eventually learned how to make scrambled eggs quickly – and it only takes two minutes of cooking time. Seriously, I timed it. Whoever’s said that scrambled eggs aren’t fast, that they take forever…this might make you reconsider when you’re in a fix for a quick meal. 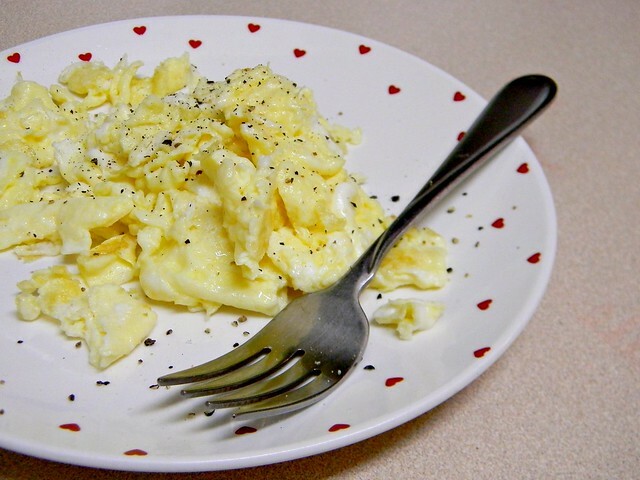 At first I felt a bit ridiculous posting something that could be found anywhere on the Internet, but scrambled eggs – no matter how many Google search results you find – have a way of intimidating if you haven’t scrambled eggs before. It gets even more intimidating when you glance across something that goes into big do’s and don’t’s of scrambling eggs, and even verging into “a little bit trying” territory when importance is even placed on how you mix the eggs. (To be fair, there are at least some recipes on my blog that have instruct a specific way of mixing something but only when it’s of the utmost importance.) I could get into the scientific side of scrambled eggs but I won’t, for the simple reason that I don’t think of all that when I’m making scrambled eggs. Science food facts fascinate me and I can and do become fixated on some things (like egg white structure for meringue, for example) but sometimes, throwing science in can make the simplest thing sound more complicated than it is; clarifying less than it does muddle. 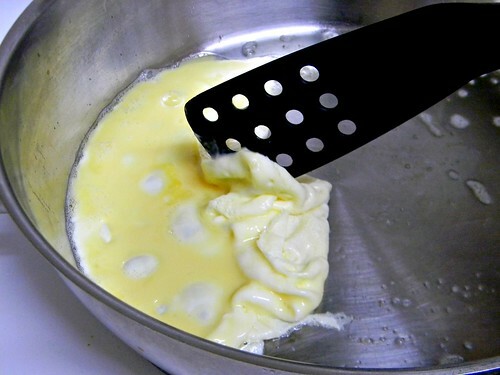 A lot of recipes I’ve seen for scrambled eggs say to add the butter as soon as the pan’s hot and to pour in the eggs once said butter is melted and foamy. But, that takes too long and furthermore, too gentle. 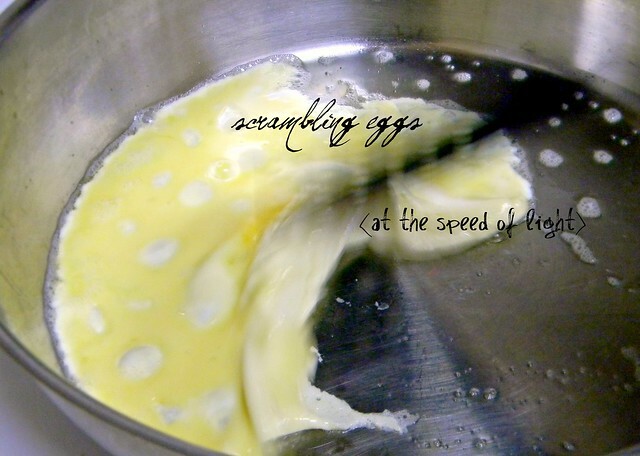 Two-minute scrambled eggs only work if you the butter starts to melt and foam immediately – and there should be some noise – upon contact with the hot pan – so fast that you can’t get a pretty picture of a pat of butter melting nicely. This procedure requires you have everything prepared in advance rather than prepping as you go. You may allow the butter to brown a little bit, but burnt butter is never a good thing (no matter how poetic Nigella tries to make it sound, it just isn’t). You’ll also like this style if you have a stainless steel pan. Some foods, like eggs, have a tendency to stick to stainless steel cookware and you usually have to use more oil than called for in a recipe using a non-stick pan, for example. The little bit of grease from the butter and the high heat helps prevent the eggs from sticking to the pan. 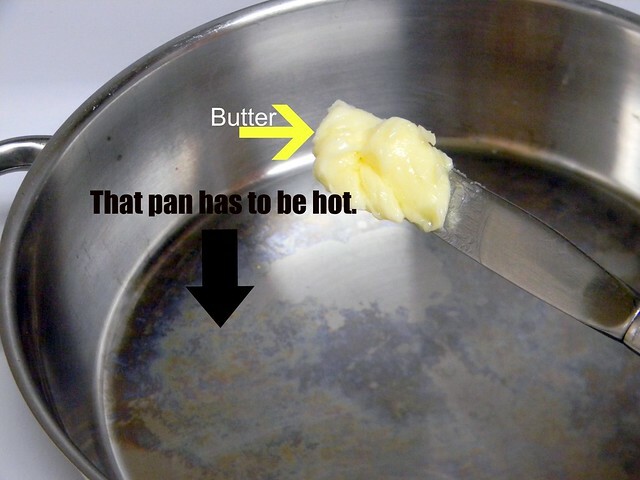 As soon as that butter’s melted and foamed, tilt the pan all around to make sure that it’s coated with the melted butter and pour in the mixed eggs. No fooling about it, the eggs start cooking immediately and they’ll bubble a bit. Once the eggs are solid but soft, transfer the scrambled eggs on to a plate and add your favourite scrambled egg condiments, or have it on a piece of toast and add condiments. These are just basic scrambled eggs. Feel free to throw in anything to fill out the eggs or that you usually eat with your eggs. Heat a fry pan over medium to medium high heat. Beat eggs with a fork and add a small amount of water (anything from a teaspoon to about a tablespoon; I always eyeball it). The water helps make the eggs fluffier. When the pan’s hot, put the butter in. It should melt and foam immediately. 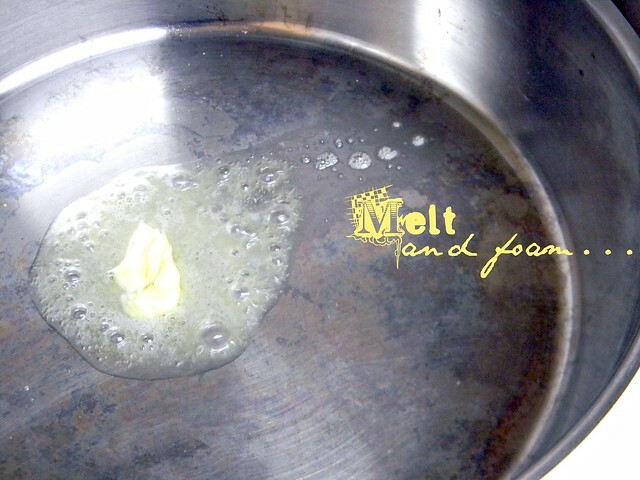 Tilt the pan to make sure that the surface is coated evenly with the melted butter. As soon as the eggs are cooked, transfer to a serving plate and season with salt and pepper or condiments of your choice. The eggs should be soft and fluffy. even faster, drizzle coconut oil in a pan while hot, crack two eggs and stir quickly using a fork just to the yolk and whites mixed. then let it sit for a few seconds and turn….voila…done and the eggs taste great and fluffly because of the coconut oil …wipe out pan and use again . Congrats on the award! You truly deserve many, my dear! Yes, I agree with you wholeheartedly, Shirley, and thank you! 🙂 I will keep your wise words in mind from here on in whenever doubt should arise if I should be posting something or not.